I have been having really, really awful eating habits this week. I am a *little* worried for my WW weigh-in tomorrow. My meals have been great, but my snacking has been terrible. At work, I’m usually fine. But when I get home, for some reason, I just want to EAT! Like my cousin’s wife told me, “Skinny girls must not eat!” 😉 But I know I just have to pick myself up, dust myself off, and keep going. And that’s exactly what I plan to do. In other news, I attended a zumba class for the first time last night. I must admit, I was really scared to try it, but it ended up being a lot of fun! I am incredibly uncoordinated and couldn’t figure out half the dance moves, but hey – I was moving and I was sweating! That’s what counts, right? =) The zumba instructor was a really sweet and energetic lady, and I loved that the class was very diverse – women of all ages and all sizes. 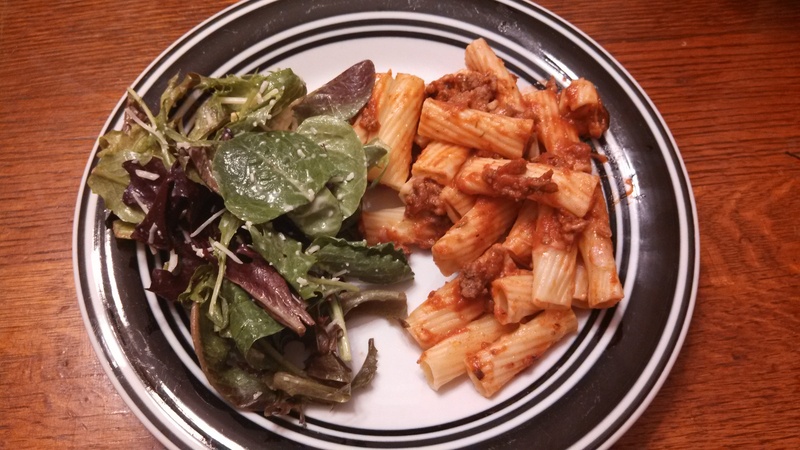 Two nights ago I made baked beef ziti, which was a Weight Watchers recipe. It was SO GOOD. I did tweak it a bit – I used one pound of ground beef instead of 1/3 pound, because that’s just ridiculous. Also, I had to change a few of the spices, because I didn’t have rosemary, I used less cheese, I used tomato sauce instead of crushed tomatoes and I used cooking spray instead of olive oil. I have listed my tweaks in the recipe below, but you can click on the link above to see the original recipe, as well. In any case, my husband as well as my roommate both gobbled it up (even though my roommate says he isn’t “a pasta guy”). The dish was incredibly flavourful, thanks to the spices in the beef. -Cook pasta according to package directions; drain and set aside. -Meanwhile, heat a deep skillet over medium or medium-high; add garlic and sauté 2 minutes. Add beef and cook until browned, breaking up meat with a spoon as it cooks; drain off any fat and set pan back over medium heat. -Add spices and stir to coat beef. Cook until herbs become fragrant, about 2 minutes. -Add tomato sauce and bring mixture to a boil (be careful when the sauce “pops” – it will create a slight mess on your stovetop! ); reduce heat and simmer for 5 minutes. -Spoon a small amount of beef-tomato mixture into bottom of a glass baking/casserole dish (just enough to cover surface); top with half of cooked ziti. Next, layer with half of remaining beef-tomato sauce and half of mozzarella cheese. Layer with remaining ziti and then top with remaining beef-tomato sauce; sprinkle with remaining mozzarella cheese. Bake until cheese is golden and bubbly, about 30 minutes.